We’re back for the seventh season of the One Page Poetry Circle where people gather to examine the works of established poets. While there’s no instructor and this is not a workshop for personal writing, once a month OPPC gives everyone a place to become teachers and learners to explore the form, content, language and meaning of poetry. Since the circle started, participants have selected and discussed 813 poems and have read countless others in pursuit of poetry that speaks to them. When we approached May’s theme, Poetry and Health, we wondered why we’d chosen what seemed a dreary subject for the merry month. A little research rewarded us with a variety of poems that were rich in irony, humor, sarcasm, madness, longing, even vigor. Within the older tradition, Dorothy Wordsworth’s plaintive words from 1835 recall what she misses while ill. Dorothy was the sister of the poet William and more known for her journals than her poetry. When shall I tread your garden path? Or climb your sheltering hill? And track the foaming rill? Here, in the opening tercets of “Progressive Health,” the poet Carl Dennis sets a darkly humorous stage for organ donations and the pleas to raise contributions. Talk about intimacy! I’d almost rather not. from his accustomed nether regions. Unfortunately we had to cancel our session on Lyric Poetry scheduled for April 14th because of renovation at the St. Agnes Library. We invite you to post your lyric poems and, if you want (and we hope you do), discuss them here on our blog. I know nothing can hurt me any longer. 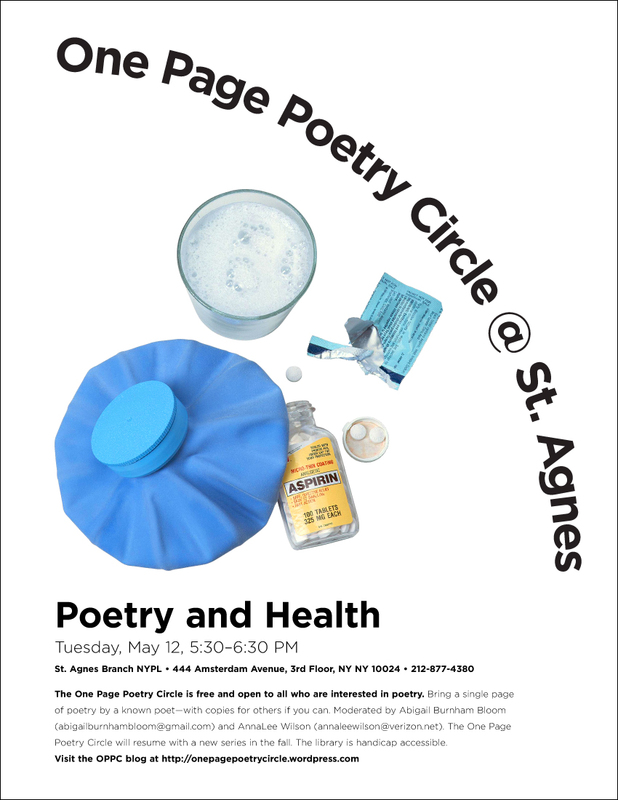 We look forward to the poems about health that you bring for discussion at the May 12th One Page Poetry Circle. Bring a friend and widen the circle! And remember to blog with us here. Don’t be shy.